DESCRIPTION: As the cost of airplane development has relentlessly increased, famous aircraft companies have merged or been absorbed. The Douglas name will no longer continue on new airplanes, but it will survive through the great heritage it was responsible for. Today, it is difficult to fully appreciate just how much of a revolution was ushered in by Douglas. It is not too fanciful to credit the company with the birth of airline travel and the huge industry that today carries millions of passengers around the world. Donald W Douglas created an aircraft manufacturing business that was initially no different from the many other companies that sprang up after 1914 to produce military aircraft for the Great War. It was a period of innovation and even more of learning. The popular biplane format with tractor engine and tailplane was establishing from the myriad of forms that had been tried and found wanting. By the end of 1918, single engine fighter and bomber aircraft had been built in tens of thousands and were now no longer required with the ending of war. That resulted in a huge fleet of aircraft that were worth virtually nothing and were acquired for entertainment, airmail services and barnstorming. Some of these aircraft, together with the much smaller number of surplus multi engine aircraft were bought at rock bottom prices to provide the first tentative airservices. The lack of aerodromes meant that longer range passenger services relied on floatplanes, amphibians and flying boats. Almost without exception it was the age of the biplane with its built-in headwind of rigging wires and struts. As the post war aircraft industries were built up around the world, there was little interest in developing sleak monoplanes. Military aircraft advanced little from the typical WWI machines. Even by 1939, major air forces still employed 200 mph biplanes in front line fighter squadrons and bombers were little better. That gives some indication of the courage of Douglas in developing metal monoplane commercial aircraft and the gull wing XB-7 bomber. The DC-1 was an outstanding aircraft that left all competitors standing. It was revolutionary. It was rapidly followed by the DC-2 which added one row of seats to the DC-1 design and could carry 14 passengers reliably and, in for the time, amazing comfort. These two Douglass machines have failed to achieve the recognition in aviation history that they deserve, but only because of the rapid introduction of the DC-3 which is by any definition the most outstanding commercial aircraft of history. It was available for WWII in the form of its C-47 military version and was built in the thousands by Douglas. It was also copied by the Russians and built by them and by communist Poland. Amazingly, DC-3 aircraft in original and modified form are still flying, mainly carrying freight but also as passenger airliners, with smaller and specialist airlines around the world. A number are part of the growing vintage display aircraft circuit, and some have been converted to turbine power. The DC3 was developed into the four engine passenger aircraft, DC-4, DC-5, DC-6, DC-7 and the C-74 Globemaster military transport. The record of the DC-3 is so outstanding that it has dwarfed other important Douglas designs and most designs of other manufacturers. The author has captured the Douglas history, but the DC-3/C-47 has understandably occupied many pages. There is a detailed record of production, but there is also an excellent review of prop and jet civil and military Douglas designs. It is very difficult to fault the book. The text is well written the research has obviously been extensive, the images, many in full colour, are outstanding, there are good line drawings and the production is faultless. 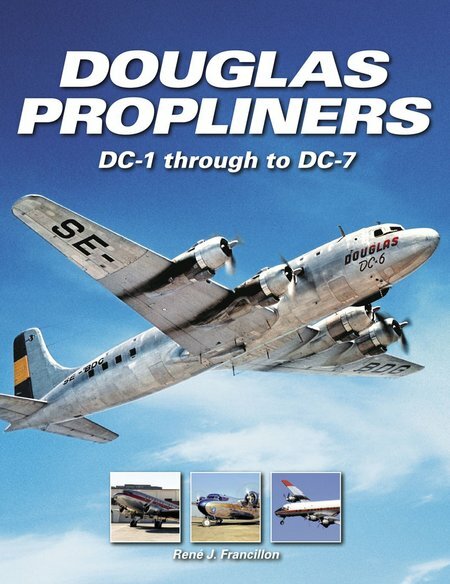 Highly recommended and undoubtedly the definitive book on the Douglas aircraft company and its designs.